Continue reading"Bringing the Search Term Crazy"
Continue reading"TweetDeck – Tag Following"
Continue reading"Using TweetDeck – Listing"
If you like to see retweets, I’d suggest creating a second column for that purpose. Watch them speed by endlessly spewing whatever it is that the collective consciousness spews. Intelligence? Yeah, let’s call it that. 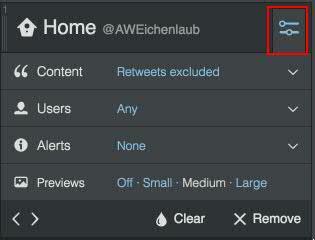 Continue reading"Using TweetDeck – Filter the Noise"